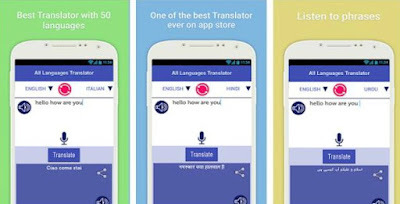 Getting tired of all the usual language translating apps out there? Are the typical translating apps taking way too much of your free phone space? Space that could otherwise be used for music, games, or taking pictures in your everyday lives? Well not to worry, because we have the perfect translating app that we would like to recommend to you today. The All Languages Translator app is everything that you’ll ever need to use as your primary translating app, from this day on. Thanks to the All Languages Translator app, translating your needed words from one language to another becomes a breeze. It has a great and intuitive interface, stunning graphics and clear fonts. With it you can translate words from up to 50 different languages. Thanks to its lightweight size, it loads up instantly, making it great for situations where you need to translate words in a hurry. You can use the speaker option and translate words directly through your voice. You can even hear the translated version of the text spoken back to you, so you can judge at how well you’ve laid out your sentence by intuition alone.